In the eyes of Western Europeans, the drainscape of Tallinn´s Old Town seems very distinct. 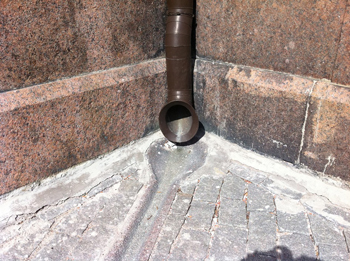 The drainpipes have double diameters compared to Western ones. There are round shaped pipes next to rectangular pipes, some with decorations, others clean and functional. Another aspect is that the discharge vents of the tubes go directly on the street rather than underground leaving open tubes scattered all over the Old Town. An agglomeration of open resonant pipes tuned by the height of the buildings like a set of instruments inscribed in the topography of the city. A two-storey house tunes it in higher tonality than a four-storey house. So it´s an open source for experimental listening and analysing. The Old Town as “big organ”. How is it tuned … how does it sound?